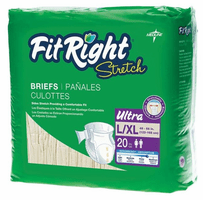 Scroll down to see our selection of Incontinence Supplies for sale. Incontinence supplies have become common products in today's society for those that may experience loss of bladder or bowel control. Stress incontinence and overactive bladder (OAB) are the main causes of incontinence and Urinary incontinence affects about 25 million Americans today. Don't be held back from living, live to the fullest, visit our site to find incontinence supplies and enjoy your mobility with confidence..